There’s no lack of commentary about the impact of women in US society today. From members of Congress, to social media mavens; tech startup founders, to ministry leaders–the influence of women is more conspicuous than ever. But when it comes to generosity and stewardship, what impact are women having? Is there anything different about the style of feminine generosity, especially as more women factor in as contributory income earners, not just family philanthropists? Just as Mary and Martha had different approaches to welcoming Jesus into their home, women today have different styles of generosity. But, on the whole–and should we be surprised?–they have different tendencies than men. In 2016, Barna conducted a study on generosity, The Generosity Gap. The primary focus of this research was to understand the differences – by generation – in the ways Christians defined or expressed generosity. However, we also found that women and men differ slightly in their expressions of generosity. There’s the Martha type, who offers hospitality as her expression of generosity, and the Mary type, who most often gives emotional or relational support. Respondents selected from among five different expressions (monetary support, emotional support, service or volunteering, hospitality, and tangible gifts) which way they are most often generous to others. Probably unsurprisingly, women indexed higher on emotional or relational support – by nearly a factor of two to one (40 percent of Christian women vs. 23 percent of Christian men) – in their expression of generosity. Accordingly, they less commonly practice each of the other expressions, including hospitality, given their bent toward emotional support. Service is their next most common form of generosity (22 percent of women), followed by monetary support (13 percent). What does this mean for charitable organizations? Can they still count on women for donations? Definitely! Must they build individual relationships with all their supporters? Not quite, but knowing that women highly value relationship, it’s important that this is a component of engaging many female donors. Charitable organizations must keep in mind that their female donors highly value relationships. Neither is it accurate to say that women completely eschew analytical rigor when making a decision to give to a certain cause. They are just as likely as men (about half) to be motivated to give by how well an organization explains what happens with donations. In other words, they have healthy expectations about the charities’ use of funds. However, this analytical evaluation is often balanced by contextual factors, such as “whether I or someone close to me has needed the sort of help the organization provides.” Nearly a third of women consider having a personal connection to a cause a motivating factor (versus only a quarter of men). Friends of mine have not one but two children with the same chronic disease. My family has walked with them as they struggled with their kids’ health and relied on God’s mercy each day for years. Needless to say, when we get their annual appeal to raise money for research towards a cure for this disease, not only we, but also our kids jump at the opportunity to help support this effort. That personal connection is powerful! 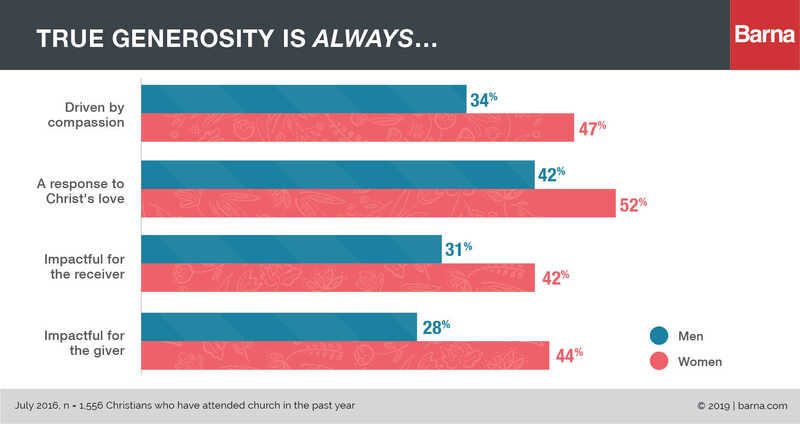 Most Christian women even admit an emotional response is part of generosity. Nearly half of women (47 percent) say “true generosity” is driven by compassion (compared with one-third of men). It is also impactful for the giver (44 percent) as well as the receiver (42 percent) in their perspective. However, women are more likely than men to say that “true generosity” is seldom or never a duty (32 percent vs. 21 of men). Rather, it is a response to Christ’s love (52 percent of Christian women say this is always true). God’s desire for us is not just to share what he has given us monetarily, but to share the fullness of our gifts–living into who He made us to be, for His glory and our growth. I love this picture of generosity–one that goes far beyond the dollars and resources we have at our fingertips but reaches in, to our hearts, and stretches out, to our neighbor. God’s desire for us is not just to share what he has given us monetarily, but to share the fullness of our gifts–living into who He made us to be, for His glory and our growth. When we look around at the Body of Christ, and the multifaceted ways in which Christians express generosity, we see a more complete picture of God’s incredible grace. How beautiful that generosity is not just an economic construct but a means by which God transforms our hearts and our world. Brooke Hempell is senior vice president of research at Barna Group, a research firm that studies issues of faith and culture. 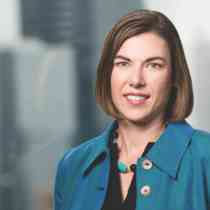 She oversees all of the firm’s research studies and advises ministries and non-profits on gleaning and applying insights from data and trends.